HARTFORD, Conn. (AP) — Fall behind on your student loans these days and you could end up getting more than hectoring phone calls and threatening letters. Some lenders are taking more people to court, attorneys say. The number of lawsuits filed over delinquent student loans that were made by private lenders has increased significantly in the past two years, lawyers told The Associated Press, even though borrowers are missing payments much less often than they did during the height of the recession. While no one tracks exactly how many such lawsuits are brought, an AP review of court websites in several states found several thousand, an overwhelming number of them filed since 2013. Loan industry officials did not return calls or would not comment on the apparent uptick in lawsuits. Among those who have been sued are Cohen’s clients Brett and Jennifer Rinehart, of Manchester, Connecticut. EduCap Inc., a major lender and loan administrator, took them to court in August on behalf of HSBC Bank, saying they owe nearly $59,000 on a student loan taken out by Jennifer, a teacher who earned a master’s in education. The two sides have yet to come to terms on a repayment plan. EduCap officials didn’t return messages seeking comment. A lawyer representing EduCap in the case against the Rineharts declined to comment. The lawsuits come as the student loan industry finds itself under government scrutiny over complaints about such things as paperwork errors and deceptive collection tactics. One explanation for the apparent rise in lawsuits is that many loan holders are now able to sue because bankruptcy cases filed by borrowers around the recession have been resolved, said N. James Turner, a lawyer in Orlando, Florida. Student loan debt cannot be collected when someone is in bankruptcy. Also, the sheer amount of money at stake — billions of dollars in delinquent loans — might be contributing to the more aggressive tack, lawyers say. Student loans from private lenders total an estimated $91 billion, or about 7 percent, of the $1.2 trillion student loan market, with federal government loans making up the lion’s share, according to MeasureOne, a student loan analysis firm. 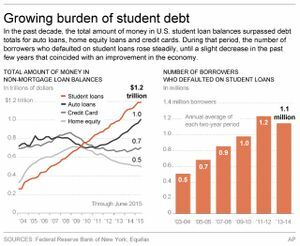 Close to 5 percent of private student loans were delinquent in the first quarter of this year, MeasureOne said. That is down dramatically from early 2009, during the recession, when the rate was nearly 12 percent. Private student loans generally have higher interest rates and less flexible repayment options than federal loans. Another possible reason for the rise in lawsuits: Loan companies are getting better at producing the more thorough documentation some judges are now demanding. Loans are often bought and sold after they are made. Many student loan lawsuits filed a few years ago were dismissed because the companies didn’t have the paperwork saying they actually owned the loans or had authority to sue. Christopher Koegel, assistant director of the Division of Financial Practices at the Federal Trade Commission, said the number of lawsuits dropped at the time, but they are on the rise again. Four to five years ago, collectors employed the usual repeated phone calls and warning letters to get people to pay, and the efforts usually stopped there, said Dallas lawyer Tom Thomas II. Lenders typically go to court to try to garnish the borrower’s wages or force the person to make a certain payment every month. Student loans backed by the federal government come with rules that allow the lender to take such action without going to court, while holders of private loans must get a judge to sign off on such steps. Borrowers can still be sued for defaulting on federal loans, but the Education Department had no immediate figures on how often that happens, and attorneys said such cases are not common. Some of the companies that are suing, such as the National Collegiate Student Loan Trusts and Navient Corp., have bundled thousands upon thousands of student loans into trusts worth billions of dollars — investment products that are then sold to investors. Lawyers and consumer activists said they do not know whether this line of business helps explain why loan companies seem to be playing hardball more often. National Collegiate has filed more than 3,000 lawsuits in New York, nearly 1,900 in Missouri, more than 400 in Connecticut and hundreds more in other states, the vast majority of them since 2013. Similar trusts run by Navient — the SLM Private Credit Student Loan Trusts — also have brought hundreds of lawsuits around the country in the past two years.